Thanks to Alex and his co-hosts. You guys are awesome! Hello everyone. Sorry I'm posting so late. I didn't forget, I was trying to multitask and failed. Today, as a newly published author, I can say without a doubt, that my insecurity didn't miraculously disappear because I published. In fact, I feel more insecure. Why? Well, now I have to market my book. I have to ask people for help, especially reviewers, and I fear they can/ will say no. My oldest sister mentioned that this is the process where I learn the other part of the writing business, which is very true. I have also been thinking of getting an author photo on my social media pages. I really want to do it because I want a more personal connection with my followers and potential readers. I like seeing what my favorite authors look like. That's just me. I might get a picture in the future, just not now. I started my second round of rewrites on my second book. Things aren't going as fast, or smooth as the first one, but I expected it. I just have to keep going and stick it out. Also, trust my own judgement. I keep thinking "what will my readers think?" when I want my characters to experience something drastic. Like I said, my insecurities are still there. There are other things you can do for marketing - book tours, Goodreads giveaway, Tweeting like I'm doing... Lots of options. Keep working on that second book. Write it for you as well as your fans. Thank you so much for the encouragement. You are awesome. Congrats on getting the first out there. Finding reviewers isn't always fun or easy, but it pays off. And keep on hammering at book 2. That's one of the best ways to promote. I'm very glad I got an author photo. Makes it easy to pull all my social media sites together because people can look and know at once, "Oh, yes, that's her!" I'm getting nervous about having to find reviewers when my book comes out in January . . .
That does make a lot of sense. I guess I just have to find a photo I like. You can try asking for reviewers on your blog. That's what I'm thinking of doing, but it is very nerve wrecking. Best of luck! Just keep going - learning and growing and, of course, writing. You can do it! Thank you! You are always so encouraging, Madeline. I appreciate it. Don't forget to market to your local media - hometown newspapers and local radio shows. But the best marketing I've gotten has been word of mouth - remind everyone who reads your book to tell their friends! Thank you, Jennifer. Those are great ideas. I say write the book for you! We second guess ourselves about so many things in our writing. Good luck with book two! Thank you, Hilary. You are very right and I will definitely do so. For me, the insecurity starts when the book is done because of the marketing. Let's hold each other's hand, okay? Congrats on publication. Kudos for jumping right into the second book. You go! If you do a blog launch I have a Author Spotlight if need hosting spot filled or if just want to do it. The module is on my sidebar with links. Just give me a shout out. Thank you very much, Juneta. You are very kind. 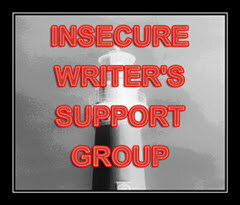 Insecurity goes hand in hand with writing, along with the publishing, editing, marketing, head shots and all that other jazz. It's all one big bag of fun, like a sack of candy and dog poo. Heheh! Definitely have to keep that in mind. I think I tend to take things to seriously. Thank you for visiting. Good luck with your second round of rewrites on the second book!! Does your area have a free community paper/gazette? Have you thought about trying to get an interview in there? I haven't actually thought of that, Michelle. Thank you for the idea and encouragement. You are wonderful. So many of us seem to be dealing with worries this month. Congratulations on your publication, and best of luck with marketing as well as your next project. I can totally relate to feeling more insecure after publication. I think it's just most surprising that it doesn't go away. You think publication will be validation but those insecurities are always there. Exactly! I agree with you absolutely. Thanks for letting me know I'm not alone. Hey Murees - I accidentally tried to comment from my husband's google account and I'm not sure where that went. I'm way behind on having Darth Techius skills. I can relate to marketing insecurities. I feel like I'm still learning how to use twitter, facebook, and goodreads for that purpose. Thank you so much, Tyrean. You amazing. Don't worry, I always wonder if I'm using Facebook, Twitter and Goodreads properly. Congratulations Murees - you did it! Hard work paid off and you know now you have what it takes for continued success. You go girl! Thank you so much, Lexa. You're dong great, Murees! Think of how far you've come and now you have suggestions for marketing. We're all anxious to help. Let me know if there's anything I can do . Thank you very much, Deanie. Drop your characters into those drastic situations and see what happens. I bet something good that your readers will love. Thank you for the encouragement. It means a lot. I agree. That is what I'm considering. Thank you so much for the support and encouragement.